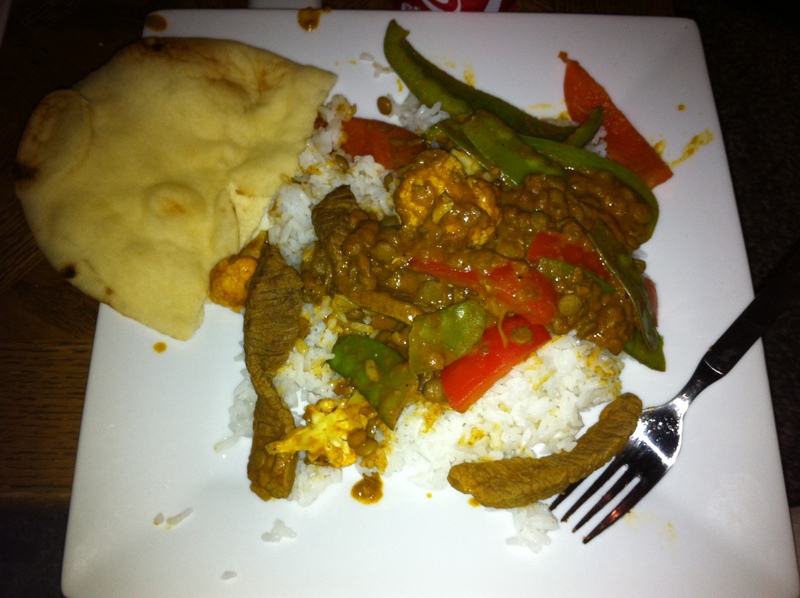 For dinner tonight, Sean (my boyfriend) and I made some curry. It’s the first time I made curry without using a complete recipe, but I took a similar one and just adapted it a lot to fit my needs. It seemed to work really well, and we made sure to make enough food so that there would be lots of left over for lunches and whatnot. Put lentils in a sauce pan with double the amount of water (1:2 ratio), bring to a boil on the stove top then bring to a simmer for around 30 minutes. Wash rice, then put 1 cup of rice into 1 1/3 cups of cold water, with a tbsp of salt. Bring rice to a boil, then bring to a simmer for 10-13 minutes. Prep the vegetables during this time by cutting green peppers and red peppers into strips, trim the snow peas, and chop some cauliflower florets into smaller pieces. Chop and dice an onion. Cut the steak into strips. When lentils have absorbed the water, take them off of the stove top and drain excess water. Reserve for later. Once the rice is done, reserve that as well. Put 1 tbsp of olive oil in a heated pan, add the onions. Stir until the onions are golden and then add the curry paste and steak. Fry together until the steak is sealed (three minutes). Add the 1 cup of coconut milk to the meat and stir well. Once combined add the lentils and vegetables into the frying pan. Stir for approximately twenty minutes. Once vegetables reach desired tenderness, take the curry off of the stove top and place over rice. This curry turned out really well, and really filling. I would have liked maybe a bit more spice to it, but otherwise it taste great. All the vegetables were nice and fresh to have, and the lentils added more protein and a nice texture. The light coconut milk ended up working fine (my grandmother always said to use regular coconut milk) and made a great sauce. Another thing that maybe should be improved for next time is to make the sauce a bit more liquid-y because it was pretty thick. However, it was really tasty! We served the curry on top of Jasmine rice (my favourite), and then we also added half a piece of naan each which we put in the oven on 200F for 6 minutes, with a bit of olive oil on it. Again, the picture was just taken quickly with an iPhone. I just don’t have the patience right now for my regular camera, and it’s just so easy to use my phone, it’s there and available… Also, the serving looks huge but I put half of it back because I couldn’t eat anymore! Very filling! We also actually made 1 cup of lentils, but put half of that into the curry. The rest we’ll use for something else, I’m thinking soup or maybe lentil patties? I’m waiting for a Lentil and Artichoke soup right now that my boss made, and it was so delicious… Hopefully I’ll get that soon!